I appreciate stories about the Moonlight Grahams of the baseball world, the guys outside the spotlight who loved the game and got a brief shot to play it at the highest level. Mark Brown is one of those guys. Even better that he played in parts of two major league seasons, one for the Orioles and one for the Twins, the Birds’ opponent in their current series. Brown earned one major league win in 15 relief appearances. It came at Fenway Park on the last day of the 1984 season. Baltimore’s staff ERA was second best in the majors that year. Brown’s line for the day read as follows: 2.0 IP, 1 H, 0 R, 0 ER, 1 BB, 2 SO. But as always, the full story is better than a single line. Here’s how it went down, as described by Jeremy Rosenberg of SABR’s Baseball Biography Project. It’s September 30, 1984, an early autumn Sunday afternoon in Boston’s Kenmore Square. The trees are already tinged with red, yellow and orange; soon the Green Monster will be the only thing still green. Inside Fenway Park, a righthander is warming up in the visitors’ bullpen. He’s built like a ballplayer — 6’2″, 190 lbs., according to his baseball card — and wears his tri-colored cap stiffly, with little curve in the brim. He’s got his road grays on, with “Orioles” stitched across his chest in orange script. His black Nike cleats have swooshes so visually loud they’re practically flourescent. In the bottom of the sixth inning, the bullpen gate opens and the righthander heads for the mound. He’s a struggling rookie, still winless after eight major league appearances; now it’s the last game of the season, his last chance to pick up a victory. In the stands, his father takes in the moment, thinking about how the two of them used to come each summer to this very place, a mere three-hour drive from home. Two innings later, Jim Rice is standing frozen at the plate and the righthander is sprinting off the field, afraid to look back. If he does, he’s sure the umpire will wave him back, tell him there’s been some sort of mistake; rookies aren’t supposed to get any breaks, especially when facing future Hall of Famers. But in this case the rookie threw the exact same pitch twice in a row — a nasty slider on the outside corner. The first time the umpire called it a ball, in deference to Rice. But not the second time. Two batters before Rice, Brown struck out Wade Boggs. 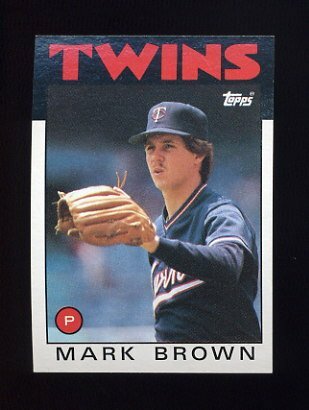 So in the process of earning his first and only major league win, Mark Brown struck out two future Hall of Famers. Things went considerably better with the last batter Brown faced as an Oriole than they did with the first batter he faced. Again, Jeremy Rosenberg tells the story. Brown finished his Orioles career 1-2 with a 3.91 ERA, 10 strikeouts, and seven walks.